Everything tastes better smothered in cheese! In my shipment of cheese this month from the Dairy Farmers of Canada, there was also their magazine full of delicious recipes featuring Canadian cheese. The stuffed pepper recipe caught my eye and looked easy enough to make. My youngest daughter eats peppers whole like they were a piece of fruit. I was curious to see how she would like them baked full of beans, cheese and rice. Surprisingly these Mexican Stuffed Peppers were quite filling! I had one and wasn’t sure if I’d be able to eat a second. Bridget ate the rice and the pepper separately scooping out the rice onto her plate. Whatever works I guess! At least she is tried them. This recipe is great for nights you want to skip the meat. This will be one that I’ll be making again and maybe play around with the filling to see what tastes good. What do you put inside your stuffed peppers? Stuffed full of beans, cheese and rice. Perfect for nights you want to skip the meat! Place peppers skin side down in an oven-safe baking dish. Mix together refried beans, rice and lime juice. Stuff peppers with bean/rice mixture. Mix cheese and cilantro together in a small bowl. Sprinkle over the peppers. Bake 15 to 20 minutes or until cheese is melted and peppers are tender. I am with you 100% on your first comment. Pour on the cheese! I order my Mexican with Queso covering it and my pizza with extra cheese, too. My husband and I want cheese on top of the normal cheese. Is there a big difference in Canadian cheese? My daughter just made us Santa Fe Stuffed Bell Peppers…they were good, and I’m sure we would like these, too. She always adds more cheese to ours. Omg . My mom makes the best stuffed peppers, I should show her this recipe. I will have to make these they look so goooood!! O’boy O’boy we love mexican food and I live with 7 food critics.Thank you for sharing, this is something different. These sound so good. Thank you for sharing and I am pinning for later! 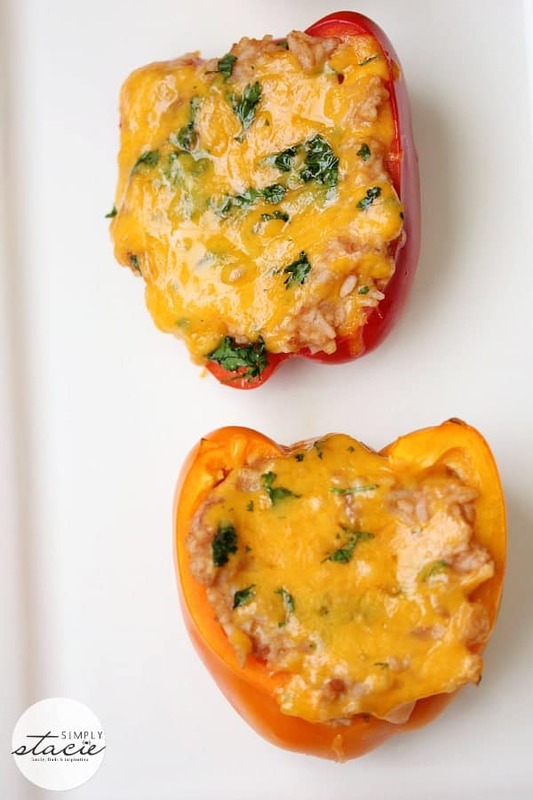 Love stuffed peppers and this recipe rocks! 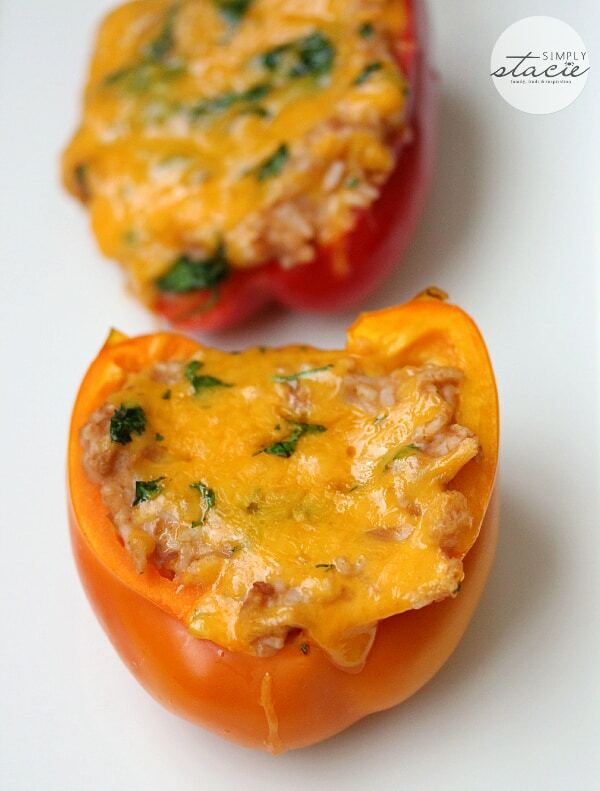 I love stuffed peppers, but I think I would love this one better it’s easier to make than mine..lol, they sound so good, gonna have to give these a try!! Oh my goodness. NOMNOMNOM!! This looks INCREDIBLE! Much better than my lame version of bell peppers stuffed with white rice, salsa and cheese. I’m trying this tomorrow. This looks delicious, I can’t wait to try it. I have never made stuffed peppers before, but if I did I would stuff them with cheese. Thank you for sharing this recipe. Thanks for another great and easy recipe! I know what we are having for dinner tonight! Oh another fabulous looking recipe thank you!! I saved it to my pinterest, can’t wait to try these! These look great! I’m vegan so I’d substitute the cheese with Daiya shreds. This looks DELICIOUS!!!!!!!!!!!!!!! Going to have to try it out! I’ve been meaning to try making Stuffed Peppers! We have been growing a bunch in our garden, and they’re almost ready. I will definitely be trying this one. Thanks for all of the great posts and recipes! These look and sound good, a nice change from the traditional stuffed pepper recipe! Thanks for sharing! What a perfect recipe! The only thing I’d change is to add a bit (ok – a ton!) of hot sauce and/or jalapeno. Thanks! This looks incredibly delicious and I think I will love it because it’s so different with the refried beans.I am going to try this.Thanks for sharing. oh my god, so goood. 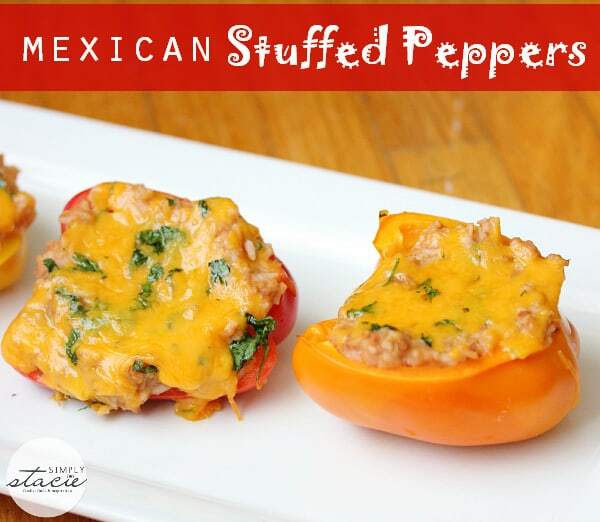 I would love these but no one else likes stuffed peppers in my family! I’d love these but I know no one else in the family would, especially if they knew they contained beans. Now I wish I had bought the big bag of peppers at the market. Oh well, I will get them next trip. That will give me time to cook the beans and rice. Sounds delicious, cannot wait to try it out! 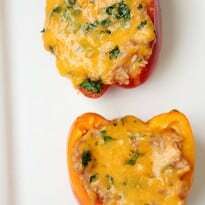 I tried these stuffed peppers and my whole family loved them.I can’t wait to make them again soon.The peppers are awesome now in the fall too. Everything about this recipes sounds really good. Will have to see if my wife could make this. These look so good! Especially with all of that melted cheese. What is the difference between Canadian mild cheddar and what we can get in the U.S.? cheddar you find in the US will work too. We love stuffed peppers! I’m totally loving this Mexican version!! Thanks for linking up at Saturday Night Fever!! Making these for dinner tomorrow but thinking of adding whole blackbeans to the rice too, plus some crushed up tortilla chips on top with the cheese for a crunchy topping! Then have guacamole, salsa and sour cream on the side too. I’ve been looking for recipes to use with refried beans because I love them!!! The only slight issue is my shopping delivery brought me refried beans with a hint of lime? Because they didn’t have the usual ones. So, I hope it still works ok and doesn’t taste odd. Thanks for the recipe! YOU ARE FEATURED! Thanks for linking up at Rhinestone Beagle! Come by and check out our “wanted” post, from sept 10th, for crafters like you to participate in out annual Howl-oween Craftathon. We’d love to have you join in. Thank you for another great recipe. These look fantastic!